This seemingly mundane advertisement appeared in the General Advertiser in May 1752. 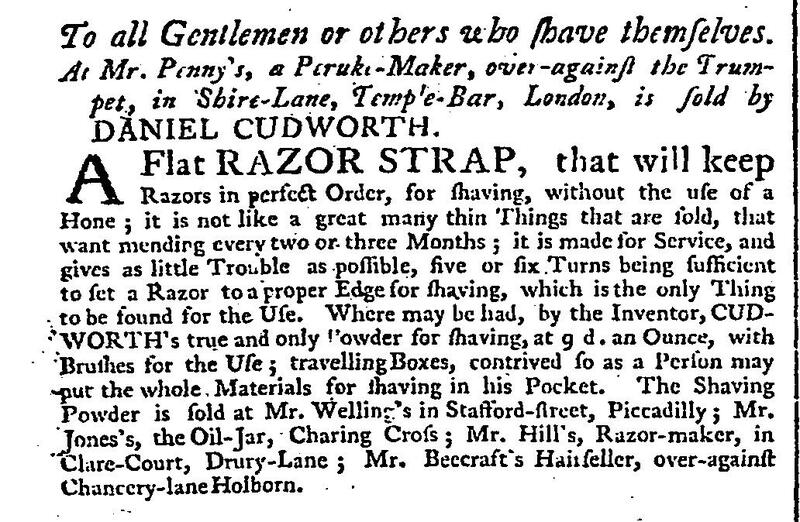 Daniel Cudworth was one of the many London business owners to take advantage of increased advertising opportunities to push his ‘flat razor strap’. On the surface, there seems little unusual here; a product, some notes about its quality and durability and a list of suppliers. And yet Cudworth’s advertisement actually pinpoints a turning point in male personal grooming. His advert is, as far as I can ascertain, the first example of a product targeted at men who ‘shave themselves’. Up to this point, the barber was the main source of shaving for the majority of men. There aren’t many personal records to suggest how often men actually visited barbers, but it seems likely that many did so every week, if not every few days. Surviving barber’s accounts also tend to point towards a frequency of every few days, often done on an account settled monthly or even annually. But, around the mid eighteenth-century, shaving – and male toilette in general, was beginning to attract a range of new products. The availability of cast steel meant sharper, more durable razors. Older steel razors were sometimes brittle and easily blunted; shavers complained about inept barbers whose lack of concentration could prove painful! But now men could buy their own, high-quality shaving equipment from specialist retailers, who also sold a range of ancillary goods. Cudworth’s main line were razor-straps (strops), long pieces of leather which were used to keep razors in pristine, sharp condition. Shaving with blunt razors was an extremely uncomfortable experience. He makes reference to the poor quality (“thin things”) passed off as steel razors, requiring repair every few months, and notes the importance of maintenance in keeping a sharp edge. Clearly, a razor was becoming something to keep, rather than a throwaway item – disposable razors were not in vogue. But Cudworth also sold shaving powders, the point of which was to soothe a smarting face but also to give it a smoother appearance. On one level these are clearly functional items. But they also represent something of a sea-change in attitudes towards male grooming. Rough masculinity was beginning to be displaced by a predilection for pampering. At the upper levels of society, it is likely that servants performed the task. A whole set of shaving paraphernalia also became available for gentlemen who travelled, including sets of instruments and even portable shaving cases, including a mirror and bowl to allow the man to perform his task in comfort. Cudworth’s advert makes reference to this new trend; his ‘travelling boxes’ were small enough to be carried in a pocket, allowing businessmen and Grand Tourists alike to take their razors, scissors etwees and so on with them on their peregrinations. Examples like this remind us that even the mundane and everyday can be fascinating. Even individual advertisements can be revealing about not only products for sale, but changing popular attitudes and social mores. It is often through these little snapshots of history that we can gain a better understanding of the bigger picture. “This book I had from — a resident of this parish (Bettws in Monmouthshire), who swears it was the book of Sansom Jones a physician of this county, some two hundred years ago”. This note, dated around the early twentieth century, appears in the front cover of an intriguing manuscript – Cardiff public library MS 2.126. Since I first came across the document in 2005, it has fascinated me as it represents something of a mystery. It is, or at least appears to be, a remedy collection dating to around the early seventeenth century. It looks and feels ‘right’. The palaeography is consistent with a document of that age. The layout is what you’d expect from an early modern receipt book and the remedies are neatly written and ordered. And yet it is one of the most frustrating sources I have ever looked at. It should be a fascinating view into the medical world of that most rare of creatures – the early modern Welsh doctor. We even have his name – relatively unusual for sources of this type. Except, so far, “Sansom Jones” has eluded every attempt I have made to find out more about him…or even to establish whether he even existed. He highlights one of the big problems for historians in trying to piece together individual lives through scattered documents. We have a few pieces of the jigsaw, but not the final picture. It also raises the danger in assuming that documents in local or county archives are necessarily from their own area. “Noblest teaching of urine to know the proffices thereof for the nature of man and woman which is known through urines. Through which urines the sicknesses of men are knowne, translated out of lattine (sic) into English. By mee Alexander Spraggot. 1569. May ixiiii”. So the plot thickens. Here we appear to have the title page of a published book by the eponymous Mr Spraggot. We have an exact date and so, at least, a starting point. Looking at the book as a whole, it does ‘feel’ very much like a published work. It is very neatly set out and has, quite unusually, a complete alphabetical index at its end. There is a section on uroscopy (the diagnosis of medical conditions by the appearance, smell and taste of human urine), followed by some general notes on life and health. These include “To knowe life or death/tokens of death”, “A treatise of Hypocras”, with astrological notes on sickness and other general observations including notes on why students are unhealthy – essentially because they spent so much time in motionless reading! The rest of the volume is given over to medical remedies, generally set out in order of different parts of the body. For headaches, for example, there are remedies for “headach proceeding of a cold cause”, “headache proceeding of heate”, “for the mygrim or rigrim” and so on. Several pages deal with purges for various conditions, including “melancholie”, “palsey” and also specific diets, e.g. for the “rhewme”. There are sections on obstetrics and childbirth as well as conditions relating to both men and women. Given the standard practice of using animal, plant, and any number of other materials (!) in remedies of this time, there is ample evidence of a full range, and nothing out of the ordinary. In many ways, there is much to support a theory of this as being the book of a practitioner; it contains just the sort of useful information that a practitioner might rely upon in his daily work. There is little evidence to suggest attributions in the book. In ‘domestic’ remedy collections (i.e. those used in families) it is common to find recipes gifted from others – e.g. my aunt’s remedy for a cold, Mrs x’s receipt for the gout, and so on. But this book has none, suggesting a more formal purpose. The fact that it is written in fair hand also supports a deliberate and disciplined document. But if we look deeper at the document, what else might it reveal? Firstly, who was Alexander Spraggot? Did he indeed write a book called ‘noblest teachings of urine’, or might this be an unpublished manuscript from 1569? The answer to the latter is no. In terms of the date, I was partly lucky, since the paper was watermarked…but even this is slightly mysterious. Having sent a copy of the watermark to a colleague who specialises in this area, the watermark turned out to be from an unusual source for an early modern Welsh document…it was from Russia. Not only this, it dated no earlier than the mid seventeenth century, meaning that, at the very least, any copy from Spraggot’s original must have been done nearly a century later. Searching under the name Alexander Spraggot reveals few likely candidates. Perhaps the most likely seems to be ‘Alexandrus Spraggot’, appointed the vicar of Martocke church in Somerset in 1564 – not a great distance from South Wales. But did Spraggot ever author a work of this name? Not as far as I can tell. There are no records in the British Library of a book by this title or author, so here the trail runs cold. So what of the second name mentioned in the book – Bethia Marsh? Here again, I’ve drawn something of a blank. A lady of this name was born near Salem, Massachusetts in 1650 – roughly around the date of the creation of the book (or at least its paper), making her an unlikely candidate. The name isn’t especially Welsh either. One possibility is that Bethia was, at some point, the owner of this book which, after all, contained a large number of useful remedies. It was common for people to write their names in such books to assert ownership, and also for remedy collections to move across families as they were gifted, especially to newlyweds. What, finally, of Sansom Jones, the mysterious Welsh practitioner of Bettws, south Wales? Is there anything to suggest that he was the true owner of the book? Sadly not. Having looked for the relatively unusual name of Sansom in likely parish records, I can find no trace…so far. He was not, at least as far as the records suggest, a licensed physician. His name doesn’t appear on any list of known doctors, nor does he appear to have been apprenticed or trained. None of this, of course, means that he never existed. He could, as many Welsh practitioners did, have simply carried on his medical practice to the local population unhindered by the need to obtain a licence, being so far from the centre in London. With such an indistinct date, he might have been of a later time period, with a misjudged attribution by the note writer. Another possibility is that he was actually from a different ‘Bettws’ than the one in Glamorganshire; there are several across Wales. And so the search continues. As I turn my attentions back to Welsh medical practice (after a hiatus studying shaving and rupture trusses in the eighteenth century) the need to find out more about the daily life and work of Welsh doctors will again become paramount. If Sansom Jones was there, and if this was indeed his book, I want to find him, as ownership of these types of documents does much to provide an alternative to depictions of Welsh doctors as obsessed with folklore and magic. p.s. If anyone can shed any light on any of this, I’d be very grateful. Whilst I was a research fellow at the University of Glamorgan, working with Professor Chris Evans, I was lucky enough to be part of a project far away from my usual research on Welsh medical history, but one which opened my eyes to an extraordinarily fruitful and fascinating area of research. As the sociologist Richard Sennett commented, the eighteenth-century body was a ‘mannequin’ upon which were hung conventions of fashion, taste and politeness. Historians, however, have been slow to recognise the important influence of ‘enlightened’ manufactured goods in this process. New industrial technologies yielded products aimed specifically at the body, of which articles made from steel were central. Steel is not often thought of in terms of its contribution to culture, but rather as a prosaic industrial material. Technological breakthroughs between the 1680s and 1740s (such as Huntsman’s crucible steel) made steel an increasingly abundant and important good. It was, however, a material that could actually play a role in the fashioning of a new, refined self, and was indeed vital for some of the most personal rituals of everyday life. It was the metal with which people had the closest, even the most intimate, physical contact. Razors were a prime example of this. Better steel enabled razor-makers to produce blemish-free, durable and more comfortable blades. Pre-crucible steel razors tended to blunt quickly and, although sharp, were not superbly keen. Part of the reason for this was the use of pre-Bessemer cementation steel, which was more brittle due to the less than uniform distribution of carbon. Crucible (or cast) steel razors were far superior; not only could they carry a much sharper edge, they could be polished to a mirror-like shine, making them far more aesthetically pleasing for consumers. 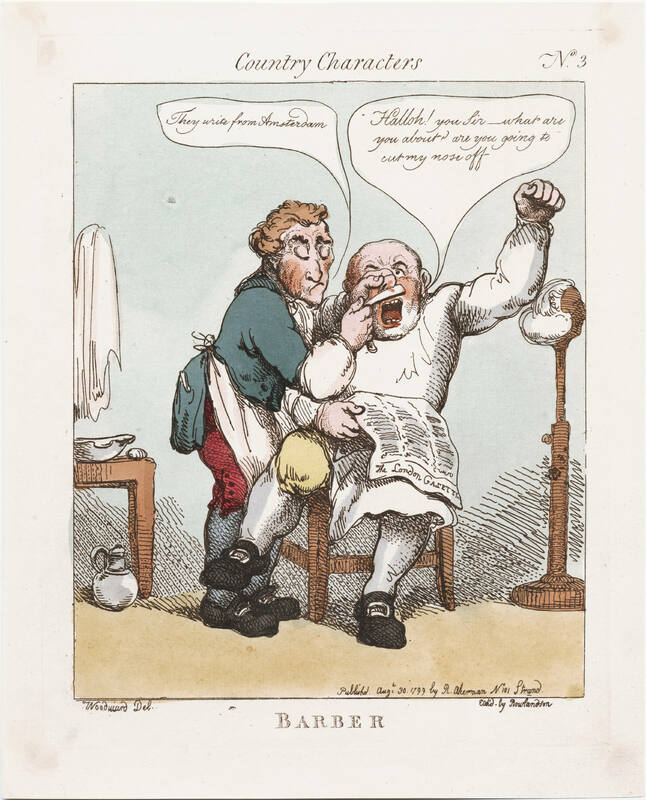 Indeed, when advertising their wares in popular publications, it was to domestic consumers rather than professional barbers that they most often appealed. Personal razors allowed their owners to meet expectations of refinement and social order. Shaving the face evinced gentlemanly neatness and elegance, while shaving the head prepared it for the wearing of a wig – an expression of genteel masculinity. Cast steel had effects in other ways. Its ability to take a sharp edge also influenced the design of surgical instruments, for example, and this led to changes in operative techniques, which had implications for both the patients and practitioners of surgery. The amputation knife was one such instrument. The standard amputation knife around the mid eighteenth century was long and straight – something resembling a chef’s knife today! But advances in steel allowed a new, curved design. This allowed surgeons to use a more natural cutting stroke around the leg, cutting through the soft tissues more quickly, before sawing through the bone. Given the risk of losing a patient through hypovolemic shock in pre-anaesthetic surgery, speed was of the essence. The springy strength of steel was likewise indispensable for medical paraphernalia from trusses to deportment collars. Here, steel was a pure Enlightenment good, scientifically honed to improve or correct nature’s vagaries. As makers of ‘elastic steel trusses’ frequently emphasised, steel was the only material with which they could claim to cure hernias or ruptures. Steel ‘neck swings’ could be used to force the body back into its ‘natural’ shape, while deportment collars and steel ‘stays’ encouraged young ladies and gentlemen to stand up straight. Other devices benefitted from the development of new types of steel. It could, for example, be employed in fixing correctional devices to the body, such as the flexible springs in spectacles’ side arms. Spectacles became a permanent part of costume, with an aesthetic value in their own right. In this process, they ceased to be indicators of bodily deficiency and acquired more positive associations (learning and sagacity), as archival and artefactual collections at the College of Optometrists can demonstrate. One of the most visible uses of steel, though, was in costume jewellery. By the mid eighteenth-century, jewellery was strongly in vogue amongst the upper echelons of society. As Marcia Pointon has noted, diamonds were the very height of luxurious and conspicuous consumption, and costume jewellery reflected a range of social mores and rituals related to society ritual and appearance. Prohibitively expensive, the potential market for these precious stones was therefore extremely limited. But steel offered new possibilities as an ersatz precious metal; here was a material which could offer all the decorative allure of diamonds, but at a fraction of the price. Cut and faceted into imitation stones known as ‘brilliants’, cast steel sparkled. With flat surfaces polished, it shone like a mirror. By the late eighteenth-century demand for cut-steel jewellery reached across Europe and appealed to royalty as well as affluent middling sorts with disposable income to match their social aspirations. Fashionable gentlemen increasingly bought cast steel watch chains, both to support their newly modish gold and silver watches, but also as a costume adornment in their own right. Added to these chains were a further range of accoutrements such as seals and lockets, which further served to draw attention to the means of the wearer. In the 1760s, chatelaines made from ‘blued steel’ presented a ‘gamut of metallic hues’. Glistening steel buttons also became an essential part of the dress of the Beau Monde, so much so that their effulgence was satirised in cartoons such as Coups de Bouton, showing a society lady cowering in the face of the blinding light reflected in the buttons of her rakish companion. But this perhaps also worked on a deeper level. Steel jewellery reflected the light but, in doing so, it also perhaps somehow reflected the spirit of the age – literal enlightenment. It is often surprising what even the most basic of materials can reveal about society and culture, as well as the technological processes involved in making them. Steel was in many ways a ‘crossover’ between technology and culture; it was both a product of the enlightenment, and something that acted as a vector for enlightened ideals, through the various uses to which it was put.